Taking a wild left turn away from Imperial Knights, this month I have a dreadnought on the workbench. 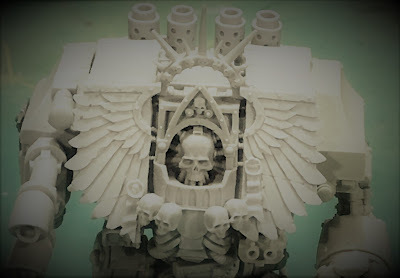 I was skipping through the last chance items on the Forge World site when I was reminded that I had a Forge World chaplain dreadnought stashed away in the resin vaults. I bought it quite a while ago and had been hoping it would get mainstream rules in the Dark Angles codex at some point. Looking at it now, I realized it would make a very cool venerable dread for the Deathwatch. The model just screams veteran status! Perhaps not the most points effect addition to the army, but I like it. With a BS of 2+, he'll make good use of the twin Lascannon. In fact, i was planning to put the missile arm on two for even more effectiveness. But I already have a dread tlike that for both Dark Angels and Grey Knights. Time for something new...and the Forge World dread claw is sooo coool! Some veteran bling was added to dress the model up a bit. A deathwatch icon on the back plate to match the Mechanicum seal. And there is always room for more scrolls. Just a purity seal for the other arm. it's pretty cool already. It'll be silver of course...I'm thinking about adding some campaign badges using decals. Another angle showing off the custom Forge World base a bit. That's a chaos dread back plate being stomped into the muck. Ready for painting! I pined the waist for now but did not glue things together so that it would be more convenient to paint the legs and up under the body. The power claw has a pin where it attaches to the shoulder and can swing up and down a bit. I'll probably glue it in at some point, but its secure for now. I did not pin the weapon arms to the body to make them easier to remove at a later date should I decide to change up the weaponry. I was going to magnet all that, but seriously...I'm not likely to play much with Dreads in my Deathwatch, if I play at all. So this model is really being done just for the love of completing this awesome sculpt from Forge World which has been left to languish for too long in the bitz box. No need to put time into magnetizing it. I have my original Deathwatch dread form DreadTober 2016 which is fully magnetized and has all the options. Very cool! I think he'll make a great addition to the Deathwing! He's joining the Deathwatch, but funny you should mention the Deathwing. The model was originally purchased as a venerable dreadnought option for my Dark Angels and would have carried the colors of the Deathwing had I completed him then. Sorry to have been so late approving your comment and responding.